About 6–7 months ago, Rangeela Goa moved out of Candolim because they needed a bigger, brighter space. We spent over an hour there recently, browsing through every nook and cranny and so many clothes, lamps, necklaces and knick knacks wanted to come home with us. Tucked inside a traditional Goan house with a stunning courtyard, Rangeela isn’t just a soulless store, but an experience. Walking around makes you feel as if you were rummaging through someone’s personal belongings; each piece has a story and looks like it's travelled the distance to be there. A lot of the stuff is sourced from manufacturers and exporters across Rajasthan, Gujarat and other parts of India while some of it is from Indonesia. 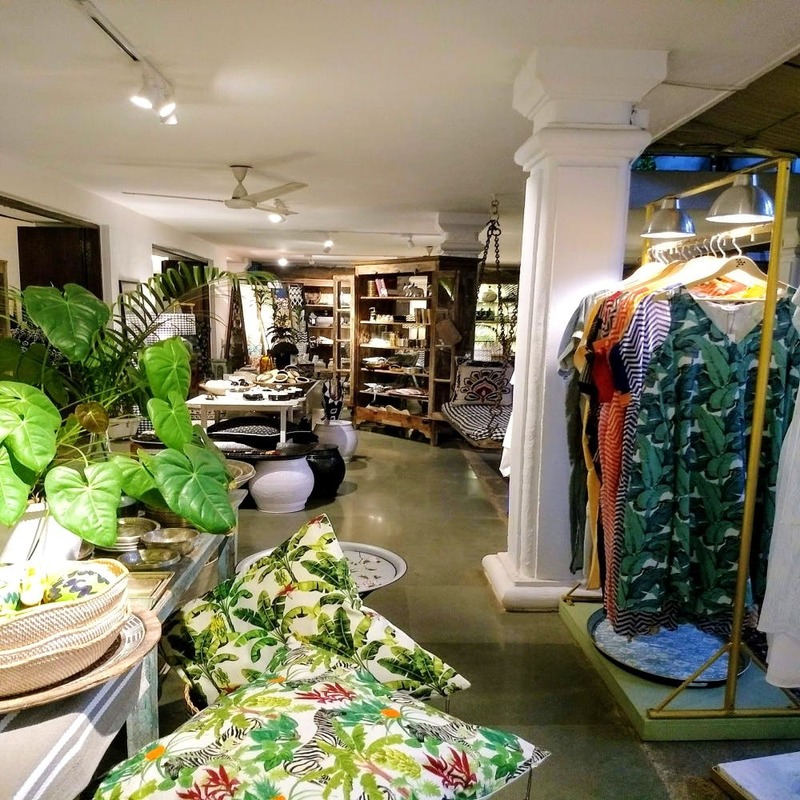 All these collections of jewellery, clothes, decor, accessories, souvenirs, furniture, linen and more make it a wholesome concept store where there’s something for everyone (and for every budget). Looking for young, casual resort wear? Check out Cochin Blue, an in-house brand that does breezy kaftans, dresses, tops and men’s shirts that are perfect for the tropics. Gado Gado, an apparel brand by a Dutch designer, is one of our faves because her dresses are resort perfect. If you, like us, are suckers for vintage patterns and lace on pastel hues, you’ll adore Gado Gado (the maxi dresses start at INR 4k). Rangeela also has outfits by Mumbai-based fashion brand Chola The Label that’s all about simple anti-fit silhouettes rendered in stunning fabrics. A recent collaboration with Baro means that Rangeela now also stocks up on furniture. That section at the end of the store with the lamps, coffee tables, sofas and the likes is a warm space. They also have the option of getting stuff upholstered with any of the fabrics they’ve got. Or, there are shelves full of small gifts and souvenirs where stuff can go between INR 300 and up to a few thousands. After that lazy afternoon of walking around, we can say that every room’s a delight and we’re going back to pick up those sari shirts that will come in handy to throw on on our bikini. Nothing honestly. We just wish we could grab a coffee here after we were done shopping but most people won’t miss that either because there’s so much to see and soak in. Plus, there's always Mojigao and Gshot Coffee Roasters to hit up for that cuppa nearby. They’re open from Tuesday to Sunday from 10am to 9:30pm. Mondays are their off days. Thankfully, they even have parking so you don’t need to worry. And hey, it’s super close to Gunpowder or Botanique so you can make a pitstop on your way.